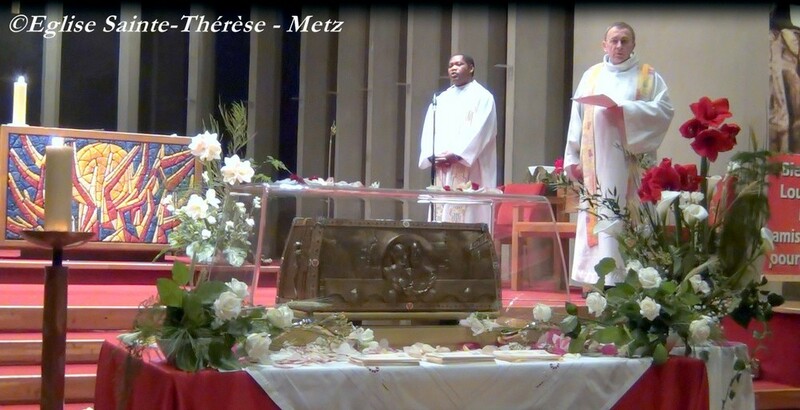 You may read it in French on the Web site of the parish in Metz. Translated by Mary Davidson. 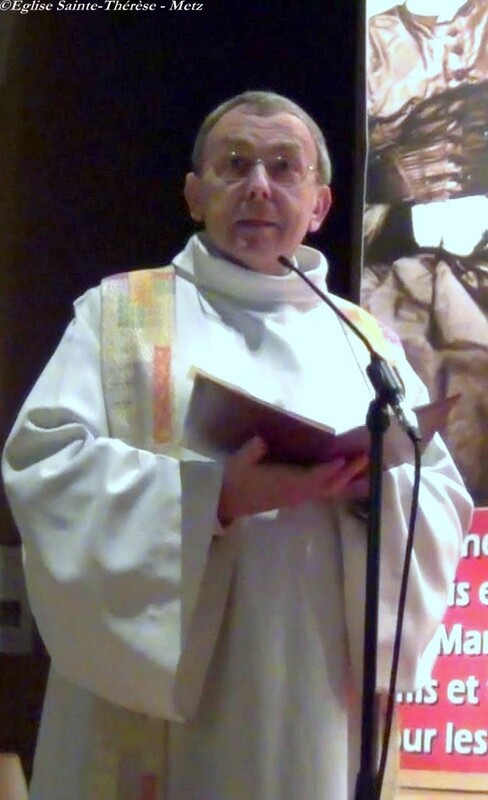 Father Jean-Claude LangeI lived and worked at the parish of Sainte-Thérèse in Metz as a young priest, and then, nearly 40 years later, in 2004, I returned as pastor. Little Thérèse accompanied me on my first pastoral experience in this parish, when people came from everywhere, so we were assured of seven Sunday Masses . (There are still four today, and Sainte-Thérèse continues to be the busiest parish in the diocese). What struck me upon my return is that the Theresian spiritual radiance, desired by the founding pastor of the church which opened for worship in 1954, remained intact. "To you my beloved saint who have saved my life twice, when I was 10 and 16 years old to this day, when I am 82 years old. I entrust to you the health of my 83-year-old husband. After 61 years of marriage, we still love each other as much, if not even more than 28 October 1950, when we were married by the parish priest in the chapel of St. Thérèse. You never abandoned me and I pray every day that you please protect our two children. Thank you, thank you my beloved saint." In 1950, the new church was not yet complete. Today, at the location of the former temporary chapel, we have a children's nursery called "Les Buissonnets!” [Note: Thérèse's home in Lisieux was called "Les Buissonnets"]. More numerous are those persons who entrust their prayer intentions to us. Many ask us to pray for troubled couples, parents who do not see their children, sick children or grandchildren, unbaptized children or children who have lost their faith, a child in prison. Reading all these requests, I thought, “Who better than a father or a mother can understand the cries of suffering?” Hence my desire to invite the Blessed Louis and Zélie Martin into our parish. After receiving the relics of St. Thérèse four times (in 1946, 1954, 1996, and 2007), the parish has now hosted the relics of her parents from November 25 to November 28, 2011. Beyond venerating their human remains, this is Louis and Zélie in person we met, honored, revered, and invoked. We touched their reliquary, but they are the ones who have touched us. For a few days we had an earthly link with a couple in heaven who are interceding for us. We found in their lives a response to the violent attacks often suffered by the family today. Through two conferences, young fathers and mothers came to know better the life of the Martins: “an ordinary family” - “an extraordinary family.” Our bishop, Pierre Raffin, celebrated the Sunday Mass and spoke to us of the Christian family today. More than 60 hours non-stop, day and night, with Louis and Zélie Martin! More than a thousand prayer requests were placed near their relics. Everyone enjoyed the beautiful and reverent celebrations. Only God sees hearts in secret, but I can say that domestic miracles occurred: many have received the grace of forgiveness in the sacrament of reconciliation; others have received the grace of inner healing of old wounds. A mother who lost a child more than 20 years ago says: “Praying with Louis and Zélie Martin, who lost four children, healed me and freed me to be reconciled with God.” Since then she has joined us regularly in the Eucharist on Sunday. 1. "To say yes: the love affair"
2. "Discover the meaning of Christian marriage from the liturgy"
In the coming months, we will dedicate one of our chapels to the Blessed Martin spouses. The rector of Lisieux, Mgr LAGOUTTE, gave us a wonderful relic of the Blesseds. We have to convert the chapel to show the relic reverently and to allow families to come and venerate it. Our church will become, in a way, a small part of the Martin family. Thérèse already has a chapel in our church, and her reliquary is in that chapel. Her two sisters, Marie-Céline (Sister Geneviève of the Holy Face) and Marie-Pauline (Mother Agnès of Jésus) followed with "great interest" the construction of our church. In a letter dated December 8, 1950, to the parish priest, they "assured him of their entreaties to their holy little sister for the completion of the splendid church erected in her honor.” They end the letter by asking their glorious sister to “respond with a shower of roses to the generosity of the donors and the zeal of the founding pastor.” The founding pastor was named Fernand MARTIN! This rain of roses has never been lacking in our parish, especially since we opened a chapel for Perpetual Adoration five years ago. Since April 2007, men and women, young and old, take turns every hour, day and night, to worship Jesus in the Eucharist. A group of fifty children, aged three to ten, have come to worship the Eucharist every month for four years. Since the opening of our Adoration Chapel, seven adults have been baptized. Many adults have received the sacrament of Confirmation. Five Alpha Courses have been proposed successfully. Magnificat! Yes, the Lord is doing great things for us!